Even by the standards of popcorn storytelling, Sleeping Giants could have stood so much taller than it does. You'd think there would be little you could do wrong with the premise of the discovery of a 20-story-tall alien battle robot buried deep underground, awaiting only the right technological triggers, indicating a sufficient level of advancement by the human race, to awaken from its robotty slumber and make its presence known. (Shades of the monolith in 2001.) And it isn't that debut author Sylvain Neuvel does anything wrong, especially. It's that he doesn't go quite far enough with the idea. 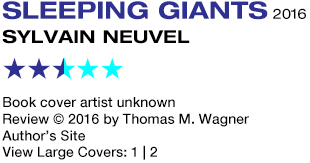 Sleeping Giants feels less like a satisfying novel in its own right than a warm-up exercise for its inevitable sequel. It all begins when 11-year-old Rose Franklin takes her brand new birthday bicycle out for a spin and promptly falls into a massive sinkhole. This is no ordinary sinkhole, though, but a clearly artificial buried chamber lined with metallic panels covered in glowing, cryptic symbols. And Rose has fallen into the palm of an enormous, 6000-year-old metal hand. What Neuvel does very well, and the part of the story I liked the most, involved the political ramifications of such a monumental discovery. Setting aside the philosophical questions about humanity's past (though speculations about what the robot was built for in the first place hint at some fascinating ideas), the practical question is what might happen to global stability across the board if one nation alone controls an invincible doomsday bot? Naturally, the US is unable to keep the robot's existence secret for very long, and a tense situation of military brinksmanship soon arises. All of this has massive escapist appeal, and Neuvel keeps his story ticking along at a brisk pace that makes its already economical 300 pages fly by. Unfortunately, the book never quite hits its marks as squarely as it should, and I think a lot of the problem lies in Neuvel's narrative execution. With a few exceptions, the entire novel is told as interview transcripts by the same interviewer, a nameless government mystery man about whom we learn almost nothing, beyond that he seems to be able to command most of the resources of the government and the military at the snap of a finger. He effectively becomes the book's principal viewpoint character, its active protagonist, as we see every unfolding event through his perspective. It's interesting as a stylistic conceit, but doesn't offer much in the way of character development, as whomever-he-is doesn't go through anything like a conventional arc. Moreover, the further you get into the book, he reads far more like a contrived Marvel character or James Bond villain (he uses no contractions when he talks, ever, and is fond of peppering his statements with calmly-voiced sinister threats) than a believable person. I kept waiting for him to say "Hail Hydra!" — it wouldn't have been out of place. Neuvel does make a fair effort to develop the rest of the cast more thoroughly, but relies too heavily on cliché, like a love triangle, to motivate interpersonal tensions. The book also lacks a defining kickass setpiece. I suppose there's no law stating that every story featuring a 200-foot killer alien robot must have it laying waste to cities or fighting kaiju. But dammit, that's the sort of thing I think audiences want from giant killer robot stories, and if your giant killer robot isn't going to do any giant killing, then what we get in its place needs to be at least as exciting. And while Neuvel sets up a couple of potentially strong action sequences, including one set in the demilitarized zone between the two Koreas, he doesn't fully commit. We are left to hope for the expected robot carnage in Sleeping Giants II, whatever it may end up being called.